Flexibility in creating sponsorship packages has been a big part of the Liberty High School football program booster club’s fundraising success. High school football isn’t so much a sport as it is a religion in the deep south. In Georgia, in Alabama, in Florida and in Texas, especially in Texas, there’s a blurry, often indistinguishable line between passion and obsession. That same obsession, er, passion, can be found in pockets of the Arizona desert. Tucked deep into the northern Phoenix suburbs, just off West Speckled Gecko Drive in Peoria, is Liberty High School. A football hotbed, to be sure. Indeed, the Liberty Lions are a winning team (they went 11-2 last season) with a rabid fan base and groundswell of community support. How much community support? Check out the Sponsors page on the booster club's website, and you’ll see more than 40 local businesses listed. 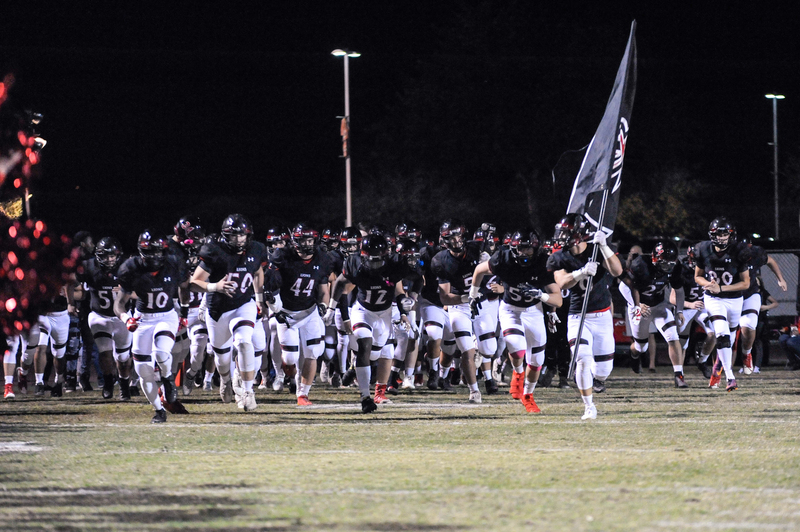 Those businesses contribute money, merchandise and more – providing the bulk of the booster club’s $80,000 to $100,000 annual operating budget. “Our community is really good, and we definitely support each other,” said Cindi Bordson, who has served as the booster club’s secretary, treasurer and vice president. Bordson also has been responsible for securing sponsorships, a job she said requires a healthy supply of shoe leather as much as anything. For Liberty’s sponsorship committee members, asking businesses for support is literally part of the daily routine. Taking a kid to the orthodontist becomes an opportunity to reach out to potential sponsor. The booster club’s Sponsors page also has links to the Lions’ Sponsorship Form and Sponsorship Letter. The Sponsorship Form lists the inventory available and itemizes the costs of a la carte items and package (Bronze, Silver and Gold) deals. Prices range from $50 for commercials aired during games and $75 for parking passes to home games up to $1,450 for two sideline tripod banners on the field. 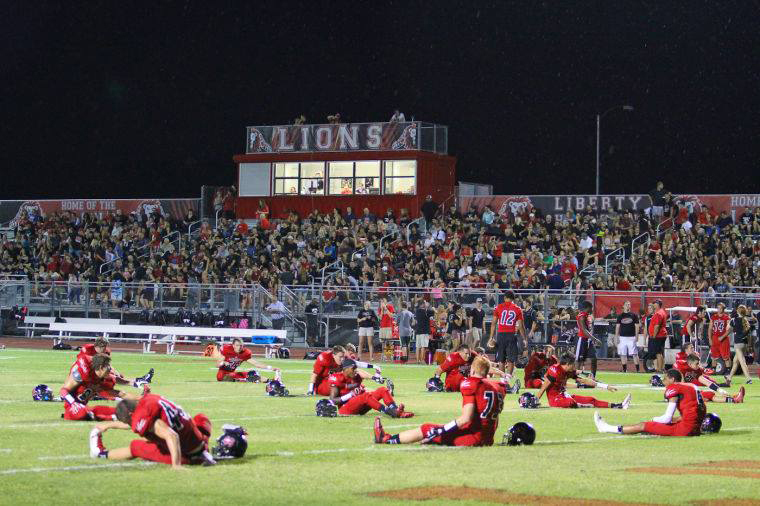 Packed bleachers are the norm on game nights at Liberty High School in Peoria, Arizona. Bordson said flexibility in creating packages has been a big part of the booster club’s fundraising success. If a business owner was interested in, say, being a golf tournament sponsor and having a tripod sign on the track during games, Bordson said a custom price package would be created to accommodate the request. Bordson, Svoboda and their colleagues on the booster club have been creative in looking for opportunities to raise money. They’ve tried “Touchdown T-Shirts” adorned with businesses’ logos (the T-shirts are thrown into the crowd after touchdowns). They’ve painted sponsors’ logos in the end zones. They host a Bleachers & Bling Ladies Night that costs $20 per person and offers the ability to buy custom Lions gear, football trivia and a crash course in football fundamentals. Because the booster club sells separate corporate, golf and team meal sponsorships, Bordson said communication as to who is selling what is crucial. So is a large group willing to approach local businesses with the different options. “It takes a village for sure,” she said. Bordson said it’s important to never say no to a business willing to offer a donation. Finally, Bordson says, the little touches matter. All sponsors receive a personalized Thank You letter at the end of the season. The letter summarizes the varsity team’s season (the Lions made it to the state semifinals last fall) and serves as a way to touch base ahead of the next season. 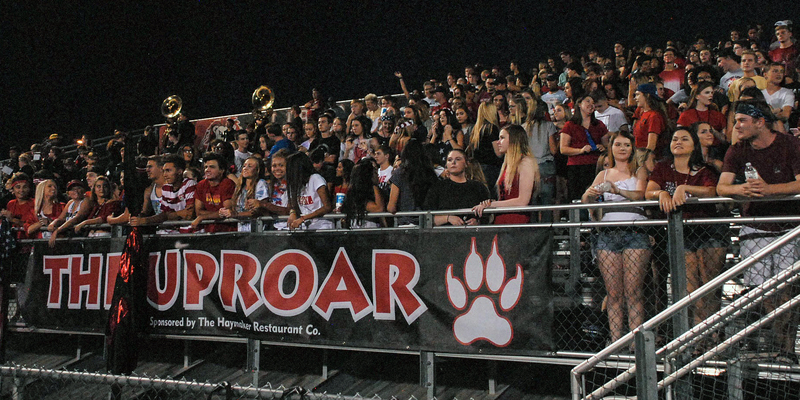 Sponsors, there's even one for the student section, are abundant for the Liberty High School football program in suburban Phoenix.